Yesterday, actually. I thought I'd finish these last week, but didn't until Sunday afternoon, when I purse-stringed the toes, sewed in loose ends, etc. 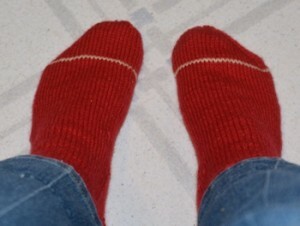 These socks were cast on early Sunday morning at KeyCon in Winnipeg, but had only some of the cuff worked when I got home--the other red pair, started before the trip, was finished on the train an hour or so before it reached the station. This is what the two pairs looked like by the time I got home. Why, you may wonder (or not ) does the new pair have a pale stripe? Why bother? This is the first of the two pairs...they're less than a month apart in age, with these having been worn only a few times--not enough to "show" when I'm washing them. Despite the apparent difference in color (it's a difference in lighting) they were made with the same yarn, same dye lot. And I did not want to confuse the pairs. So the second has a stripe. 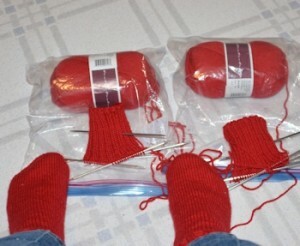 Since I have an overage of red yarn (all the same manufacturer, same color number, and more of them the same dye lot) I will be knitting quite a few red socks, and decided to mark the pairs with a toe stripe--each pair will have a different color toe stripe and if I run out of colors I'll start making two-row stripes, not one-row stripes for the second round. The older red socks show enough wear that I can tell them from the new ones. And why does that matter? Because I'm tracking durability of the various yarns and reinforcement stitches pair by pair, and if the pairs get scrambled, then the data aren't good. And now I'm onto the second sock of the yellow-striped shorty pair, with the heel turned. The first sock is almost to the toe decreases, but I'm going to catch up with sock #2 so I can finish them at the same time. The shadow near the wingl needle on the sock to the right is caused by the bulge of the turned heel. 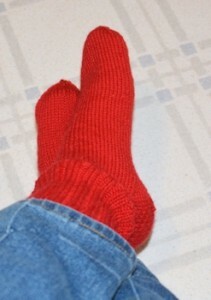 The first socks I knitted were red; it's a color that gives me confidence. I would say it's my favorite color of socks, except I also like blue, green, purple, and turquoise--and stripes of other colors--so I have different colored socks to suit different moods. Oh yes. I think this is why I enjoy your socks so much. Besides I have a passion for crafting (though my craft of choice is usually embroidery), and enjoy the intricacies of your craft and seeing efforts come to fruition, you seem to favour colours which resonate strongly with my own taste. 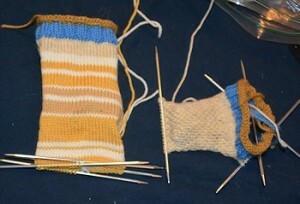 Sock #2 of the yellow stripes are now (as of June 16th) past the gussets and well onto the foot. Would like to finish these before leaving for SoonerCon next week, and be partway into the next short pair. This will involve using the ball winder on some skeins. "Because I'm tracking durability of the various yarns and reinforcement stitches pair by pair, and if the pairs get scrambled, then the data aren't good." This line makes me all happy inside. Using the word as a plural, planning on data cleanliness, and then using the data. It makes my little data loving heart happy. I'm glad your knitting is going so well. I'm almost tempted to try to replicate your success ... then I remember that I have cats who would be VERY helpful with the project. One of my intellectual snobberies--remembering that "data" is a plural noun. Glad you like it that way. I'm unable to turn off my interest in the data, even though the variations in durability by color (some dyes affect the brittleness of the fibers, apparently) and thus dye lot as well as manufacturer, may make it impossible to get truly clean numbers out. So far, most of the socks knit in Ella rae Classic seem to be lasting about 100 wearings and sometimes more. (Some days are harder on socks than other days--sitting here typing v. on my feet walking places.) I don't have complete wear records for all the socks--I don't have an easy data entry setup for them. I do have the date they came off the needles and how many (in terms of week rotations) socks they "joined" at that point. The Cascade 220 Superwash socks went "limp" after the first washing and got limper and limper, but the purple pair hasn't thrown a hole yet. The Plymouth Yarns Galway Nep is also still doing well. The Mountain Colors socks (are recent--one just a couple of months old, in a slower rotation, and one about 8 months old) are being watched to establish their baseline--it's an expensive yarn but if it wears longer, it might be worth it. (It feels great, doesn't go limp after washing, color does run but sock stays saturated...we'll see.) The Herdwick socks are a year apart in age, worn only in below-freezing temps (too hot to wear in rotation in warmer weather) and the one that's had almost 20 wearings doesn't show any wear at all. Most socks do show some "relaxation" in the ribbing about then.